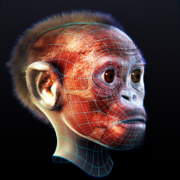 Australopithecus (/ˌɒstrələˈpɪθɪkəs, -loʊ-/ OS-trə-lo-PITH-i-kəs; from Latin australis, meaning 'southern', and Greek πίθηκος (pithekos), meaning 'ape', informal australopithecine or australopith (although the term australopithecine has a broader meaning as a member of the subtribe Australopithecina,  which includes this genus as well as the Paranthropus, Kenyanthropus, Ardipithecus, and Praeanthropus genera)  is a 'genus' of hominins. From paleontological and archaeological evidence, the genus Australopithecus apparently evolved in eastern Africa around 4 million years ago before spreading throughout the continent and eventually becoming extinct two million years ago. Australopithecus is not literally extinct (in the sense of having no living descendants) as the Kenyanthropus, Paranthropus and Homo genera probably emerged as sister of a late Australopithecus species such as A. Africanus and/or A. Sediba. During that time, a number of australopithecine species emerged, including Australopithecus afarensis, A. africanus, A. anamensis, A. bahrelghazali, A. deyiremeda (proposed), A. garhi, and A. sediba. Australopithecus species played a significant part in human evolution, the genus Homo being derived from Australopithecus at some time after three million years ago. In addition, they were the first hominids to possess certain genes, known as the duplicated SRGAP2, which increased the length and ability of neurons in the brain. One of the australopith species evolved into the genus Homo in Africa around two million years ago (e.g. Homo habilis), and eventually modern humans, H. sapiens sapiens. Gracile australopiths shared several traits with modern apes and humans, and were widespread throughout Eastern and Northern Africa around 3.5 million years ago. The earliest evidence of fundamentally bipedal hominids can be observed at the site of Laetoli in Tanzania. This site contains hominid footprints that are remarkably similar to those of modern humans and have been dated to as old as 3.6 million years. The footprints have generally been classified as australopith, as they are the only form of prehuman hominins known to have existed in that region at that time. Modern humans do not display the same degree of sexual dimorphism as Australopithecus appears to have. In modern populations, males are on average a mere 15% larger than females, while in Australopithecus, males could be up to 50% larger than females. New research suggests, however, that australopithecines exhibited a lesser degree of sexual dimorphism than these figures suggest, but the issue is not settled. 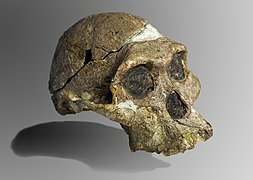 The fossil record seems to indicate that Australopithecus is the common ancestor of the distinct group of hominids now called Paranthropus (the "robust australopiths"), and most likely the genus Homo, which includes modern humans. Although the intelligence of these early hominids was likely no more sophisticated than in modern apes, the bipedal stature is the key element that distinguishes the group from previous primates, which were quadrupeds. The morphology of Australopithecus upset what scientists previously believed — namely, that strongly increased brain size had preceded bipedalism. Australopithecines have thirty two teeth, like modern humans, but with an intermediate formation; between the great apes and humans. Their molars were parallel, like those of great apes, and they had a slight pre-canine diastema. But, their canines were smaller, like modern humans, and with the teeth less interlocked than in previous hominins. In fact, in some australopithecines the canines are shaped more like incisors. The molars of Australopithicus fit together in much the same way human's do, with low crowns and four low, rounded cusps used for crushing. They have cutting edges on the crests. Robust australopithecines (like A. boisei and A. robustus) had larger cheek, or buccal, teeth than the smaller – or gracile – species (like A. afarensis and A. africanus). It is possible that they had more tough, fibrous plant material in their diets while the smaller species of Australopithecus had more meat. But it is also possibly due to their generally larger build requiring more food. Their larger molars do support a slightly different diet, including some hard food. Australopithecines also had thick enamel, like those in genus Homo, while other great apes have markedly thinner enamel. One explanation for the thicker enamel is that these hominins were living more on the ground than in the trees and were foraging for tubers, nuts, and cereal grains. They would also have been eating a lot of gritty dirt with the food, which would wear at enamel, so thicker enamel would be advantageous. Or, it could simply indicate a change in diet. Robust australopithecines wore their molar surfaces down flat, unlike the more gracile species, who kept their crests, which certainly seems to suggest a different diet. The gracile Australopithecus had larger incisors, which indicates tearing and more meat in the diet, likely scavenged. The wear patterns on the tooth surfaces support a largely herbivorous diet. When we examine the buccal microwear patterns on the teeth of A. afarensis and A. anamensis, we see that A. afarensis did not consume a lot of grasses or seeds, but rather ate fruits and leaves, but A. anamensis did eat grasses and seeds in addition to fruits and leaves. These observations have been interpreted as evidence that P. robustus may have fed on hard and brittle foods, such as some nuts and seeds. More recently, new analyses based on three-dimensional renderings of wear facets have confirmed earlier work, but have also suggested that P. robustus ate hard foods primarily as a fallback resource, while A. africanus ate more mechanically tough foods. A recent study looking at enamel fractures suggests A. africanus actually ate more hard foods than P. robustus, with double the frequency of antemortem chips. A study in 2018 found non-carious cervical lesions, caused by acid erosion, on the teeth of A. africanus suggesting the individual ate a lot of acidic fruits. Then, in 1997, an almost complete Australopithecus skeleton with skull was found in the Sterkfontein caves of Gauteng, South Africa. It is now called "Little Foot" and it is around 3.7 million years old. It was named Australopithecus prometheus which has since been placed within A. africanus. Other fossil remains found in the same cave in 2008 were named Australopithecus sediba, which lived 1.9 million years ago. A. africanus probably evolved into A. sediba, which some scientists think may have evolved into H. erectus, though this is heavily disputed. A taxonomy of the Australopithecus within the great apes is assessed as follows, with Paranthropus and Homo emerging among the Australopithecus. The genus Australopithecus with conventional definitions is assessed to be highly paraphyletic, i.e. it is not a natural group, and the genera Kenyanthropus, Paranthropus and Homo are included. The exact phylogeny within Australopithecus is still highly controversial. Approximate radiation dates of daughter clades is shown in Millions of years ago (Mya). Sahelanthropus, Orrorin, and Ardipithecus, possibly sisters to Australopithecus, are not shown here. Even though Australopithecus is classified as a "genus", several other genera appear to have emerged in it: Homo, Kenyanthropus and Paranthropus. This genus is thus regarded as an entrenched paraphyletic wastebasket taxon. Resolving this into monophyletic groupings requires extensive renaming of species in the binomial nomenclature. Possibilities are to rename Homo sapiens to Australopithecus sapiens (or even Pan sapiens), or to rename all the Australopithecus species. 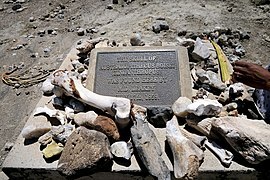 The spot where the first Australopithecus boisei was discovered in Tanzania. Taung Child by Cicero Moraes, Arc-Team, Antrocom NPO, Museum of the University of Padua. ^ Wood & Richmond 2000. ^ Briggs & Crowther 2008, p. 124. ^ a b Wood 2010. ^ Cela-Conde & Ayala 2003. ^ David A. Raichlen; Adam D. Gordon; William E. H. Harcourt-Smith; Adam D. Foster; Wm. Randall Haas Jr (2010). Rosenberg, Karen (ed.). "Laetoli Footprints Preserve Earliest Direct Evidence of Human-Like Bipedal Biomechanics". PLoS ONE. 5 (3): e9769. Bibcode:2010PLoSO...5.9769R. doi:10.1371/journal.pone.0009769. PMC 2842428. PMID 20339543. ^ a b Bower, Bruce (May 20, 2006). "Hybrid-Driven Evolution: Genomes show complexity of human-chimp split". Science News. 169 (20): 308–309. doi:10.2307/4019102. JSTOR 4019102. ^ a b Beck, Roger B.; Linda Black; Larry S. Krieger; Phillip C. Naylor; Dahia Ibo Shabaka (1999). World History: Patterns of Interaction. Evans ton, IL: McDougal Littell. ISBN 978-0-395-87274-1. ^ Zihlman AL, Cronin JE, Cramer DL, Sarich VM (1978). "Pygmy chimpanzee as a possible prototype for the common ancestor of humans, chimpanzees and gorillas". Nature. 275 (5682): 744–6. Bibcode:1978Natur.275..744Z. doi:10.1038/275744a0. PMID 703839. ^ Griffith, Jeremy (2013). Freedom Book 1. Part 8:4G. WTM Publishing & Communications. ISBN 978-1-74129-011-0. Retrieved 28 March 2013. ^ David-Barrett, T.; Dunbar, R.I.M. (2016). "Bipedality and Hair-loss Revisited: The Impact of Altitude and Activity Scheduling". Journal of Human Evolution. 94: 72–82. doi:10.1016/j.jhevol.2016.02.006. PMC 4874949. PMID 27178459. ^ Thorpe, SK; Holder, RL; Crompton, RH. (2007). "Origin of human bipedalism as an adaptation for locomotion on flexible branches". Science. 316 (5829): 1328–31. Bibcode:2007Sci...316.1328T. doi:10.1126/science.1140799. PMID 17540902. ^ Richmond, BG; Begun, DR; Strait, DS (2001). "Origin of human bipedalism: The knuckle-walking hypothesis revisited". American Journal of Physical Anthropology. Suppl 33: 70–105. doi:10.1002/ajpa.10019. PMID 11786992. ^ a b Kivell, TL; Schmitt, D. (Aug 2009). "Independent evolution of knuckle-walking in African apes shows that humans did not evolve from a knuckle-walking ancestor". Proceedings of the National Academy of Sciences of the United States of America. 106 (34): 14241–6. Bibcode:2009PNAS..10614241K. doi:10.1073/pnas.0901280106. PMC 2732797. PMID 19667206. ^ Lovejoy, C. O. (1988). "Evolution of Human walking". Scientific American. 259 (5): 82–89. Bibcode:1988SciAm.259e.118L. doi:10.1038/scientificamerican1188-118. PMID 3212438. ^ McHenry, H. M. (2009). "Human Evolution". In Michael Ruse; Joseph Travis (eds.). Evolution: The First Four Billion Years. Cambridge, Massachusetts: The Belknap Press of Harvard University Press. pp. 261–265. ISBN 978-0-674-03175-3. ^ a b c d Kay, R.F., 1985, 'DENTAL EVIDENCE FOR THE DIET OF AUSTRALOPITHECUS', Annual Review of Anthropology, 14, pp. 315-341. ^ Martínez, L., Estebaranz-Sánchez, F., Galbany, J., & Pérez-Pérez, A., 2016, 'Testing Dietary Hypotheses of East African Hominines Using Buccal Dental Microwear Data', PLOS ONE, 11, pp. 1-25. ^ Billings, Tom. "Humanity's Evolutionary Prehistoric Diet and Ape Diets--continued, Part D)". Archived from the original on 8 January 2007. Retrieved 2007-01-06. ^ a b Grine FE (1986). "Dental evidence for dietary differences in Australopithecus and Paranthropus - a quantitative-analysis of permanent molar microwear". Journal of Human Evolution. 15 (8): 783–822. doi:10.1016/S0047-2484(86)80010-0. ^ Scott RS, Ungar PS, Bergstrom TS, Brown CA, Grine FE, Teaford MF, Walker A (2005). "Dental microwear texture analysis shows within-species diet variability in fossil hominins". Nature. 436 (7051): 693–695. Bibcode:2005Natur.436..693S. doi:10.1038/nature03822. PMID 16079844. ^ "(PDF) Behavioral inferences from the high levels of dental chipping in Homo naledi". ResearchGate. Retrieved 2019-01-10. ^ Billings, Tom. "Comparative Anatomy and Physiology Brought Up to Date--continued, Part 3B)". Archived from the original on 15 December 2006. Retrieved 2007-01-06. ^ Nature. "Evidence for Meat-Eating by Early Humans". ^ Nature (2010). "Butchering dinner 3.4 million years ago". Nature. doi:10.1038/news.2010.399. ^ "Root grooves on two adjacent anterior teeth of Australopithecus africanus". International Journal of Paleopathology. 22: 163–167. 2018-09-01. doi:10.1016/j.ijpp.2018.02.004. ISSN 1879-9817. ^ a b Lewin, R. (1999). "The Australopithecines". Human Evolution: An Illustrated Introduction. Blackwell Science. p. 112. ^ Lewin, R. (1999). "The Australopithecines". Human Evolution: An Illustrated Introduction. Blackwell Science. p. 113. ^ "New stratigraphic research makes Little Foot the oldest complete Australopithecus". ^ Celia W. Dugger; John Noble Wilford (April 8, 2010). "New Hominid Species Discovered in South Africa". The New York Times. ^ Saylor, Beverly Z.; Scott, Gary; Levin, Naomi E.; Deino, Alan; Alene, Mulugeta; Ryan, Timothy M.; Melillo, Stephanie M.; Gibert, Luis; Haile-Selassie, Yohannes (2015). "New species from Ethiopia further expands Middle Pliocene hominin diversity". Nature. 521 (7553): 483–488. doi:10.1038/nature14448. ISSN 1476-4687. ^ Villmoare, Brian (2018-01-30). "Early Homo and the role of the genus in paleoanthropology". American Journal of Physical Anthropology. 165: 72–89. doi:10.1002/ajpa.23387. ISSN 0002-9483. PMID 29380889. ^ "(PDF) 2 @BULLET Enhanced cognitive capacity as a contingent fact of hominid phylogeny". ResearchGate. Retrieved 2019-01-12. ^ "Cowen: History of Life, 5th Edition - Student Companion Site". bcs.wiley.com. p. 20/5. Retrieved 2019-01-12. ^ Fleagle, John G. (2013-03-08). Primate Adaptation and Evolution. Academic Press. p. 364. ISBN 9780123786333. ^ Schwarz, J.H. (2004). "Barking up the wrong ape--australopiths and the quest for chimpanzee characters in hominid fossils". Collegium antropologicum. 28 Suppl 2: 87–101. ^ Flegr, Jaroslav (2013-11-27). "Why Drosophila is not Drosophila any more, why it will be worse and what can be done about it?". Zootaxa. 3741 (2): 295–300. doi:10.11646/zootaxa.3741.2.8. ISSN 1175-5334. ^ Pietrzak-Franger, Dr Monika; Schaff, Prof Dr Barbara; Voigts, Prof Dr Eckart (2014-02-28). Reflecting on Darwin. Ashgate Publishing, Ltd. p. 118. ISBN 9781472414090. ^ Gribbin, John (2009-08-27). Science: A History: A History. Penguin Books Limited. ISBN 9780141042220. ^ Hawks, John (2017-03-20). "The plot to kill Homo habilis". Medium. Retrieved 2019-03-24. Barraclough, G. (1989). Stone, N. (ed.). Atlas of World History (3rd ed.). Times Books Limited. ISBN 978-0-7230-0304-5. .
Leakey, Richard (1994). The Origins of Human Kind. New York: BasicBooks. ISBN 978-0-465-03135-1. .